GST is upon us, but our KK Dive Shop is ready! Home/Dive Shop, News/GST is upon us, but our KK Dive Shop is ready! Now GST is upon us, but our KK Dive Shop is more than ready with the thorough preparation they’ve had in the past several weeks! Supervisor Karen attended to ‘waves’ of walk-in clients who came in to take advantage of our GST-free products up until April 1st! Because of the increased popularity during that time, Karen is eager to order more to keep our stock healthy. She’s also been researching some additional items that would benefit our clients on their various travels in Kota Kinabalu and Sabah. 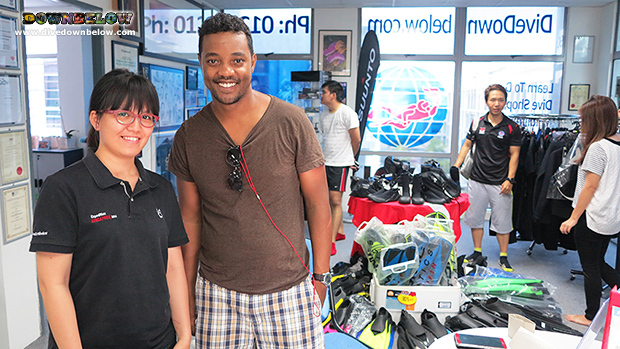 It’s always one of the most exciting ‘happenings’ in our Kota Kinabalu Dive Shop, as well as our Sabah Travel Centre, when Karen’s orders are delivered to our HQ. The reason being that our staff get the opportunity to understand the features of new items to benefit them with their product knowledge and assist our walk-in guests where our Dive Shop Supervisor Karen might need assistance from time to time. Many of our clients are recreational divers, and they are inspired to progress their diver education to become professional on our Go PRO internship programs to qualify as PADI Divemaster or PADI Open Water Scuba Instructor (OWSI). Get more details on the products of our KK Dive Shop and the value-for-money packages we offer our Go PRO internship candidates! By Joanne Swann|2015-04-03T11:01:20+08:00April 6th, 2015|Dive Shop, News|Comments Off on GST is upon us, but our KK Dive Shop is ready!